Follow these steps to set your default sharing permissions, share an email folder with other UWM students, faculty, or staff, and add a folder that has been shared with you. Before you can share email folders with other users, you must set up your account's default folder permissions. If you do not do this before sharing, the folders you share will remain inaccessible to those users. 2. In the Permissions for window, select the Default name (if necessary) and check the Folder visible box near the bottom-right corner of the window. Now that your default permissions are set up, you can go ahead and share any email folder following these steps. 3. 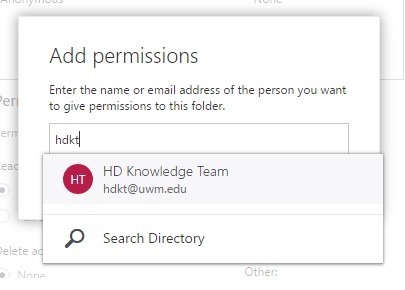 In the Add permissions window, type the name or email address of the person you want to share this folder with and click Search Contacts & Directory (if you have emailed this person before or they are one of your contacts, the name should appear as you type). 7. Send the person you just shared the folder with an email message to let them know they now have access. If you need to unshare an email folder with someone, select their name from the list of permissions, click the trash can, and click OK. If you need to edit someone's permissions, select their name from the list, change their permissions accordingly, and click OK. When someone shares a folder with you, you must manually add it to your list of email folders. There are no automatic notifications when someone shares a folder, so it is incumbent upon the sharer to let the recipient know about it. Follow these steps to add a folder that's been shared with you. 2. In the Add shared folder window, type the name or email address of the person who shared the folder with you and click Search Contacts & Directory (if you've emailed this person before or they are one of your contacts, the name should appear as you type).